Spending your next holiday in the baltic states? Discover the lithuanian capital and the best neighborhoods to stay in Vilnius! Located in the south-east of the country, a few kilometers from Belarus, Vilnius is Lithuania’s most populous city with 554,192 inhabitants spread over 401 km². Founded under the reign of Gediminas (1275-1341), the Grand Duke of Lithuania, Vilnius has undergone many invasions over the centuries, so much so that the city today blends numerous architectural styles: Gothic and Baroque as well as Classical or Renaissance architecture. Its well-preserved historic city center, dating back to the 13th century, is listed as World Heritage List by UNESCO. Though the accommodation in Vilnius can be expensive despite the low cost of living, you’ll find a wide array of lodgings to choose from: expensive hotels on the one hand, but also hostels and youth hostels on the other hand, convenient if you are traveling on a tight budget. Vilnius is a like a window opening on seven centuries of history, a territory that has been under multiple influences. If you are looking for a place to stay in Vilnius, here is a brief presentation of the best areas to stay in Vilnius. The gem of the Lithuanian capital, the old city center has its roots in the emblematic ruins of the castle of Gediminas, built between the 14th and 15th century on its eponymous hill. This historic part of town is extremely well preserved and really worth a visit. Like most medieval towns, the old town was built in a fan-shaped manner around the castle. It is one of the best preserved in Europe. You will find many historic buildings – Lithuania has been a major hub of influence in Eastern Europe during the course of its history – as well as multi-centenary churches such as the Church of the Holy Spirit (Orthodox), the St. Casimir Church, the Catholic Cathedral of Vilnius, Church of St. Peter and St. Paul (Baroque) and the famous Gate of Dawn, a place of Catholic pilgrimage. Also, the city abounds with green spaces, including numerous parks, squares, and public gardens. The Pavilnių Regional Park, for example, covers the entire heart of the city! And of course, the city is home to many museums giving you a chance to discover Lithuanian culture: the KGB Museum, the Genocide Museum, Gediminas Tower, the Palace of the Grand Dukes of Lithuania, the National Museum of Lithuania. You’ll also find plenty of restaurants and bars to relax in all parts of the city. The historic center is a beautiful place to stay in Vilnius, ideal if you want to immerse yourself in Lithuania’s rich history and cultural heritage. 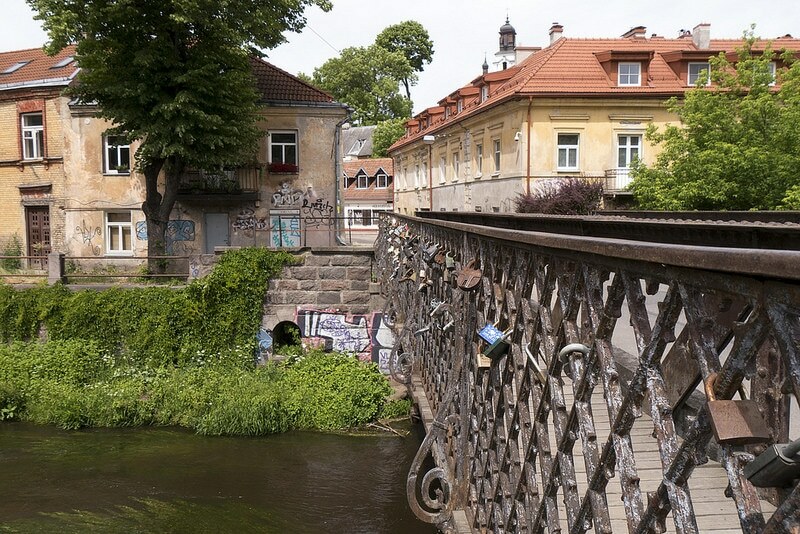 An unofficial republic populated by 7,000 people inside Vilnius – a micro-nation within the city, if you will – the Uzupis district is a formerly neglected area from Soviet times, where the bohemian artists of the Lithuanian capital chose to settle. The inhabitants even went so far in 1995 to create their own Constitution along with an anthem and a flag and even established their own citizenship, laws, and leaders. It is a festive, artistic district, welcoming a number of friendly and cosmopolitan yearly festivals. Uzupis does not have a legitimate diplomatic or consular authority, but you still need a visa to enter the neighborhood during annual festivals. If you’re attracted by alternative culture, self-government or the forms of irredentism of the populations wishing to administer themselves differently, you should definitely visit Uzupis. 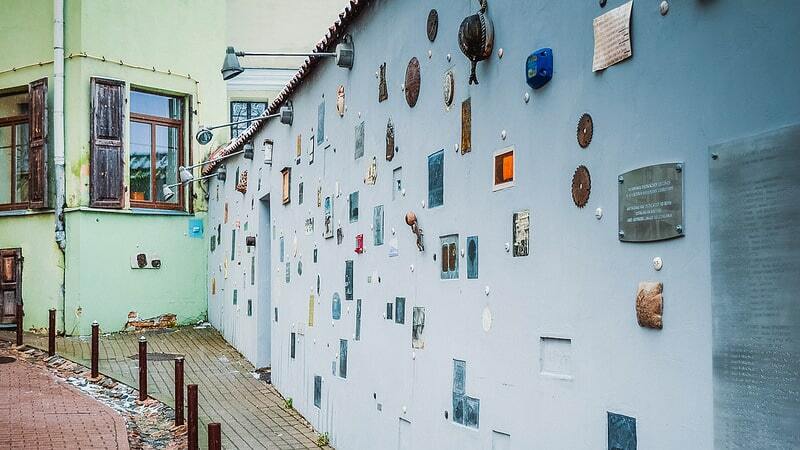 If you are looking for a place to stay in Vilnius, don’t hesitate to look for a room in Uzupis.